Steven (Chicagoland, United States) on 10 February 2010 in Art & Design and Portfolio. 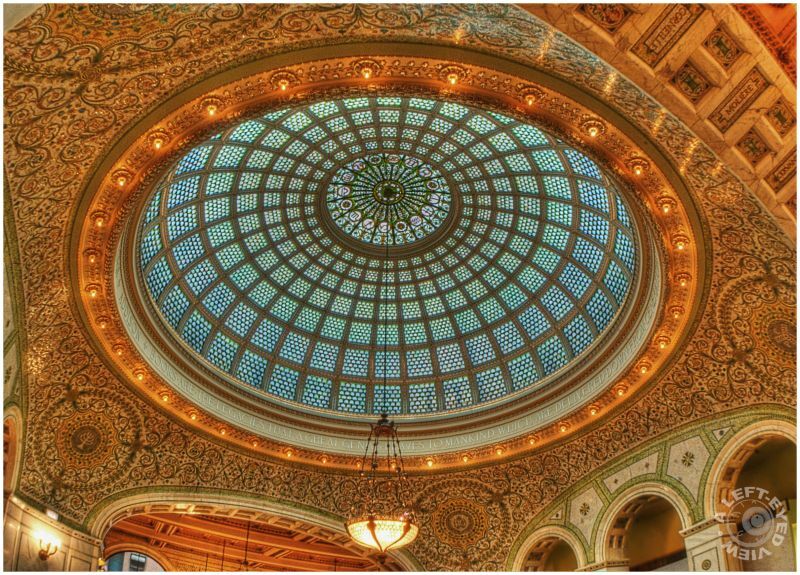 The use of my new wide-angle lens allowed me to capture the entire Tiffany dome inside the Preston Bradley Hall of the Chicago Cultural Center, formerly the Chicago Public Library's Main Branch. Inlaid in the oblong archways seen here are mosaics which identify the surnames of authors and philosophers like Voltaire, Goethe, Schiller, Cervantes, Galileo, Tasso and Dante. Subsequent to the World's Columbian Exposition of 1893 held in Chicago, it was boasted that this room was "by far the most extensive piece of wall-mosaic work undertaken since the decoration of the cathedral at Monreale, Sicily, in the 13th century." Everything seen above the arches is mosaic artistry. Below the arches, the marble walls are accented with mosaic details, such as the details seen here and here. Photo taken February 5, 2010. Amazing, such exquisite detail, it's wonderful. What a great shot, and the detail! Wonderful details and colors, well done! wide angle lens is great for these kind of shots.. I wish I had one of those when I went to Rome..
Gorgeous, the detail is just beautiful here. And because it woke me up early this morning, I have to ask, did you feel the earthquake? It was a 4.3. @Self-Indulgence: I felt it, but thought it was my furnace. I was surprised by what I heard on NBC 5 this morning and when they said what time it hit, it put me at rest that it wasn't my furnace. Beautifully captured; this is an incredible piece of artistic architecture. Thanks for background info. Great architecture, and great capture of it. Simply fabulous Steve, I'm waiting to see tomorrow's picture when you were lying flat on your back directly underneath that central lamp with the camera to your eye. Eh, err, what you say? @Curly: I did lay on my back in previous visits when I didn't have a wide-angle lens. Those captures were linked to under "Previous captures" above. I have been fortunate enough lately to not find the room roped off to the general public. That was always a "downer" after driving 35 miles into Chicago. Very nice POV. Wonderful detail. Absolutely gorgeous details and tones! I recently picked up a 35mm standard wide-angle. We are not...clicking :\ I'm not sure if it's the lens or the user!!? Every shot of this dome you take gets better! Super capture! Brilliant! That wide angle lens got put to good use here. This dome is so gorgeous. Love it. The detail you brought out in this photo is extraordinary! this is one of the wonderful landmarks in chicago. very nicely captured! I like it ! Very detailed and graphic !